Basic Service vs Full Service – Which Do I Choose? Getting your car serviced is important. 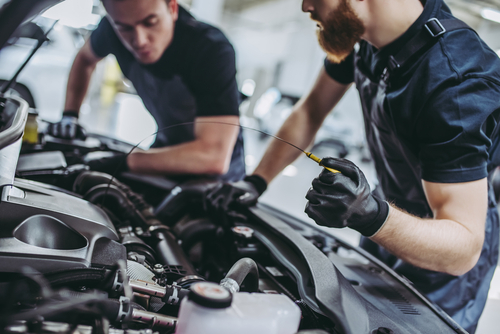 It is recommended that your car is serviced every 12,000 miles and 12 months, as this will ensure your car is maintained properly and kept in good nick. At Freeway Exhaust & Tyre Centre, we offer 2 main options for servicing. We have a basic service and a full service, depending on what your requirements are. Although servicing your car is not a legal requirement, it will ensure your car stays running smoothly and efficiently throughout. Please read your vehicle handbook for more specific details on your vehicle’s requirements. We recommend that you get a basic service every 6000 miles or every 6 months, depending on how often your drive your vehicle. This service is also ideal for cars that do lots of short journeys. Oil Filter Replacement: An oil filter is extremely important, as it filters the oil that goes around the engine. Particles, dust and dirt can sometimes make their way into the oil, which is why an oil filter replacement is vital. If this is not changed then it can cause all sorts of issues. Oil Change: A regular oil change will make sure that the performance of your vehicle stays at its best. We use clean, quality oil that will ensure your engine is moving and operating as it should. Our high-quality oil includes Valvoline. Tyre Pressure Check: We also include a tyre pressure check in the basic service, to ensure your tyres are at the right level. We will make sure that your tyres have the correct inflation. Underinflated or overinflated tyres will reduce the lifespan of your tyres, so it’s important to get this checked out. Air Filter Replacement: The air filter prevents any dirt or particles from making its way into the engine. An air filter replacement will make sure that the filter is clear. This will also prolong the life of your engine as a clear air filter will prevent any damage from dust, dirt and other particles. Fuel Filter Replacement: It is important that your fuel filter is changed regularly, as a blocked filter will restrict fuel flow. This can also cause issues with the engine, which will damage the running of the vehicle. A fuel filter replacement will maximise the engine’s performance and prevent any misfires. Pollen Filter Replacement: Although pollen filters are fairly new to many vehicles, it’s important that these get checked. The filter takes pollen and other particles out of the air before it enters your car. This prevents the driver from being affected by pollen, dust or dirt. Although this will not benefit your car, it will benefit the driver of the vehicle and their health. Light Checks: Our technicians will check to make sure all of your lights are working properly, which includes the front and rear lights. It is illegal to not have your lights on at night and in many other scenarios, so it’s essential that your lights are working. This also applies to your reverse light, if it not working then it could cause an accident as other drivers will not know you are going to reverse. Brake & Suspension Checks: The braking and suspension system in your car is extremely important and should never be ignored. If your brakes fail then this could cause a dangerous accident. We will check your brakes and identify any problems if there are any. If your brakes need replacing then we will also advise on this to ensure your car is as safe to drive as possible. Our comprehensive car service starts from just £140. We would recommend that you allow around 2 hours for your vehicle to be fully serviced and tested, as this will ensure it is done properly. Our car servicing is complete to the highest standard so that your vehicle can be driven from our centre straight away. If you have any questions regarding our car service, please call today on 01892 520022 to speak to one of the team!